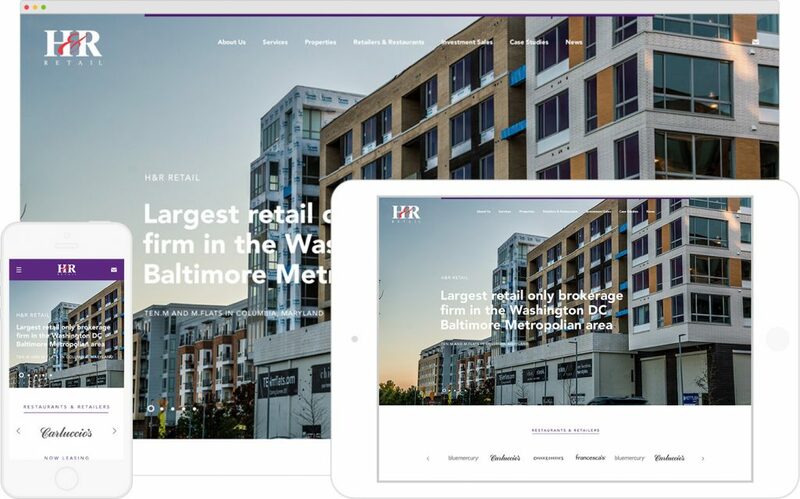 H&R Retail, a real estate brokerage firm focused exclusively on retail tenants, landlords and developers in the greater Washington DC/Baltimore area, partnered up with inMotion to revamp their company website and improve their online presence. They have a team of established retail experts representing property developers and land owners in all types of retail environments. They represent retailers and restaurants with acquisitions and site selection, as well as with investment properties sales and assist in the disposal of surplus properties. H&R Retail provides a completely integrated retail solution for their clients. They engage, connect and communicate with clients and retailers to leverage every single asset. H&R trusted inMotion with the responsibility of redefining their online presence with the creation of a custom website in order to further modernize the look and feel of their brand. It was important to capture all of the aspects of their business and the clients they represent across the Washington DC/ Baltimore region. inMotion’s designers and developers stepped up to the task and delivered a website with the aesthetic qualities and functionality needed for the current online environment. 1) User Experience – Enhancing the user experience and navigation to make the site more accessible and navigable for anyone coming to the H&R site to learn more about the company, their services and current property listings. 2) SEO optimization – It was paramount to make the new site more SEO (search engine optimization) friendly and searchable within the respective search engines online.